There’s a lot of excitement over Chevrolet’s award-winning new Bolt EV. 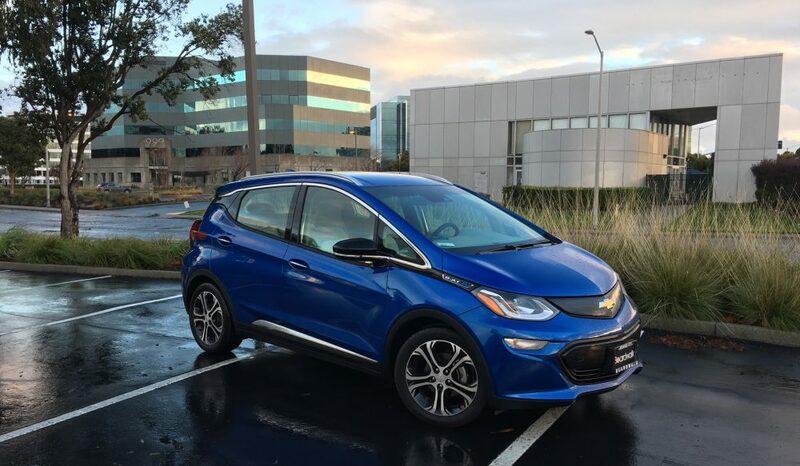 Chevrolet promised to begin deliveries in December of 2016, and on December 13, in Fremont, California, three lucky customers drove their Bolts home. One of them was Bill Mattos, a retired law enforcement officer, who happens to live right there in town. It turns out that Bill has been an EV enthusiast for a long time, since he got a rare opportunity to drive GM’s EV1 back in 1999. Bill couldn’t buy or lease one—the waiting list was long, and GM notoriously cancelled the EV1 program—but he decided then that as soon as GM offered another EV, he’d be one of the first people to get one. He got his chance when the diminutive Chevrolet Spark EV came out. Bill’s next EV was the larger Chevrolet Volt—a hybrid. He got the second-generation 2016 model. But not long after, he read about the upcoming all-electric Bolt and got excited. And, Bill told the folks at Fremont Chevrolet to let him know immediately when they started taking orders so he could be the first one on the list. And that’s just what they did. On October 2, Bill drove down to Fremont Chevrolet and placed his order. As it turns out, Fremont Chevrolet is the top EV seller in the Bay Area (and Fremont also happens to be where EV rival Tesla’s plant is located). So, when GM decided to deliver the first three Bolts there, Bill got a call to come on down and pick up his car. The dealership sent a car for him, since he would be driving his Bolt home. Bill really likes the car so far. Bill likes the ergonomics of the new Bolt, and how, with its 238-mile range, he doesn’t have to plug it in every night. He’s had a few challenges using the new displays, but Bill knows it’s just an initial adjustment—and part of being an EV pioneer. If you’re in the Fremont area and have a hankering for a new Bolt, contact Kurt Mietz, Fleet and Commercial Specialist, at Fremont Chevrolet. Call 650-766-7777 or email to: kurtm@cacargroup.com. Chevy Bolt Gets a 238-mile Range! Today, Chevrolet released the official EPA range for the new Chevrolet Bolt all-electric vehicle. It’s 238 miles–more than what was advertised earlier, and enough to put all the other EVs in the dust! Yeah, you can spend three times that amount for a Tesla, but in the world of regular earth-loving folks, the Bolt is set to change the story. And, with the newly updated website, you can now see the models and colors available and a lot more information. Price is still not official, but they’re talking about $37,500 before the Federal and California rebates, so it could be a $30K car. I personally can’t wait to order mine in brilliant blue! Now, we also know that the Bolt, like the Volt, will come in two levels–LT and Premier. Want leather seats and shinier wheels? The Premier it is. You also get roof rails, heated front and rear seats, various life-saving alerts, and more. The website lists the differences. Based on my experience with the Volt, the upper level car will look and feel better, but will cost several thousand dollars more. I just hope that I like the LT and that I can get it with DC fast charging. That method of charging lets you add about 90 miles to the battery in the time it takes to have a relaxing cup of coffee and a snack on the way somewhere. In a related piece of good news, Volkswagen, BMW, and ChargePoint (the largest car charger company) have teamed up to build 95 Level 2 and DC charging stations as part of the Express Charging Corridors Initiative along the East and West Coasts. For me in California, that means Highway 5 and 1 between Portland and San Diego. Back east, it’s between Boston and Washington, DC. That’ll go a long way to helping folks with EVs with 90 mile ranges get out and see the country. Of course, the Bolt, Teslas, and upcoming 200-mile cars like the next Leaf, will become even more worth owning. Chevy now has a new EV-themed site, Chevyevlife.com, that explains about living with an electric car. After all, they are going to have three models to sell soon, including the Bolt, the fine new 2016/2017 Volt plug-in hybrid,and the Malibu Hybrid. The tiny Spark, having blazed the modern EV trail for the brand, has quietly exited the building.